What is Proppant and How Is It Used in Fracking? Proppant, in its use as part of the process of hydraulic fracturing, or “fracking”, is hailed as one of the most impactful oilfield innovations of the 21st century, despite the fact it has been used since the notion of modern fracking was developed nearly 70 years ago. This is because specific technological advances made over the past 30 years have truly revolutionized the industry. By combining better drilling techniques with ultra-sophisticated frack designs, today’s proppant solutions help improve the production capacity of wells, delivering more oil and natural gas, day in and day out. How is Fracking Carried Out? Fracking’s origins can be traced back nearly 200 years when producers discovered that explosions underground could make it easier to bring oil to the surface. Various groups tested forms of this theory in the early-to-mid 1900s, culminating in Standard Oil’s test of the Hugoton Gas Field in 1947. In this test, the company injected 1,000 pounds of gelled gasoline and sand into underground limestone. Two years later, Halliburton ran a similar test, and the effectiveness of fracking was proven. While fracking was found to be successful for extracting petroleum liquids like natural gas and oil, fracking as we know it today wasn’t developed until the 1990s, when George P. Mitchell combined existing fracking technology with horizontal drilling to access oil-rich shale deposits thousands of feet underground. Today, horizontal drilling is carried out by drilling vertically until a shale layer is reached. At this point, the drill bit turns sideways and extends the well outward, which positions a long lateral segment of pipe to hydrocarbon-rich shale. Shale by nature is impermeable, meaning it does not feature naturally occurring fissures through which oil and or natural gas can flow. To prompt production, the well must be “completed,” which is a separate phase in the drilling process whereby perforations are made along the entire link of the lateral wellbore. During the completion (fracking) phase, a mix of water, chemicals, and proppant is forced into the wellbore at super high pressure, fracturing the shale, thus allowing petroleum liquids to move out through the perforations and up to ground level. How much proppant is needed for fracking? It varies by well, depending on the overall length of the wellbore and the physical characteristics of the rock. A typical Wolfcamp well drilled in the Permian Basin features an 8,500-foot lateral and requires 13 million pounds of frac sand. How Is Proppant Used in Fracking? When the liquid mix of proppant, chemicals, and water are propelled into a well, the sudden impact opens fractures in the rock. If nothing is used to hold these fractures open, they’ll close, and the number of hydrocarbons that can escape will be far lower. 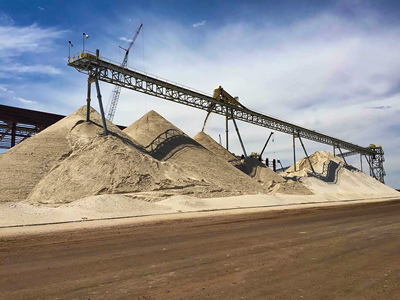 Completion designs today utilize either naturally occurring crystalline silica sand or an engineered proppant material including ceramic. Because of their use in super-high pressure environments (often 10,000 feet below the surface), proppants are highly crush-resistant to hold fractures open for as long as possible, helping to increases the productivity of the well. Modern-day producers continue to push perfect their completion designs. By seeking to find an optimal balance of lateral lengths and proppant intensity, even further gains in domestic oil and natural gas production could be on the horizon.